At Animal Man’s Mini Zoo we have been providing children’s party entertainment for over 15 years. It’s something that we love doing and hope to be doing for another 15 years. We at Animal Man’s Mini Zoo provide animal themed kids birthday parties throughout Central Scotland. 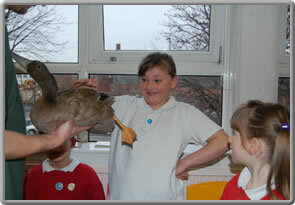 We provide Kids animal party Glasgow and Edinburgh and Perth, Dundee, Fife and everywhere in between. The great fact about having an Animal Handling party experience is that the children all learn loads of cool facts, and animal welfare issues, along with environmental information, all at the same time as having loads of fun. Animal Man’s Mini Zoo cater parties from tots to teenagers, so we can cover a wide range of ages. The great thing about our parties is that if you have a group of children of varying ages, then it works very well. Quite often the case with birthday parties is that a lot of family will be there, so cousins, brothers, sisters etc, so there is always going to be an age range. Our Animal Parties are probably the best solution to making sure everyone has a great time. Kids animal party Glasgow and Edinburgh. Most other types of kids party entertainment is very age specific, like karting, climbing, swimming, clowns, magicians etc. Everyone loves animals, so with an animal handling party there really is loads of options for every age group. Kids animal party Glasgow and Edinburgh. It’s a simple party to host too. You don’t need loads of room, just enough room for everyone to have a seat on floor or round the room. We’ve never been to a party where we’ve not been able to do a show because of size of room, so don’t stree. We come along on the day to your house or hire venue and bring everything we need with us. All you supply is the floor to stand on and the audience. It’s very simple to book for a Kids animal party Glasgow and Edinburgh and everywhere else. Email Kate or Kevin at animalmansminizoo@gmail.com and we’ll get right back to you. Looking for availability for sat 11th February at 1030 in Edinburgh? Hey Jenny, has anyone got back to you on this yet? Milan is a charitable organization and is holding an event on 14th may at meadow bank stadium and will be expecting more than 1200 turn out. we will have food, clothes, house hold goods and beauty stalls. We will also have children’s corner with children’s activities. would you be interested in a stall? look forward to hearing from. Hey Annette, yes we can do that for you, I’ll send over the party info. Hi, can I book you for the 22nd July please? Hi, Do you have any availability for a 3 yr olds party on Sat 24 June – a small gathering of friends/family. Thanks. Hi do you attend small community village days? Approx 30 to 40 kids attend plus adults? If yes are you available on sat 3rd june and what is rhe cost? Hi are use takin bookings for next year sun 4th march . No how busy use are so thought I’d get it booked in . It’s for a 5th birthday party. Looking for animal party for my boys 8th birthday party. Can you tell me if your able to do, 13th August 2017 and how much. Hi Leanne, I will email you now. Looking for an animal party for my son’s 6th birthday party. Can you please tell me if you have availability for Sunday 3rd September 2017 and how much it would be. Hey Elizabeth, yes we can do that depending on timings and location. I’ll email you now. Hi, I was wondering if you are free Saturday 9th September for a 3yr olds party and the cost? Hi i was wondering if uv any availability on Dec 1st for a home visit,thanks.